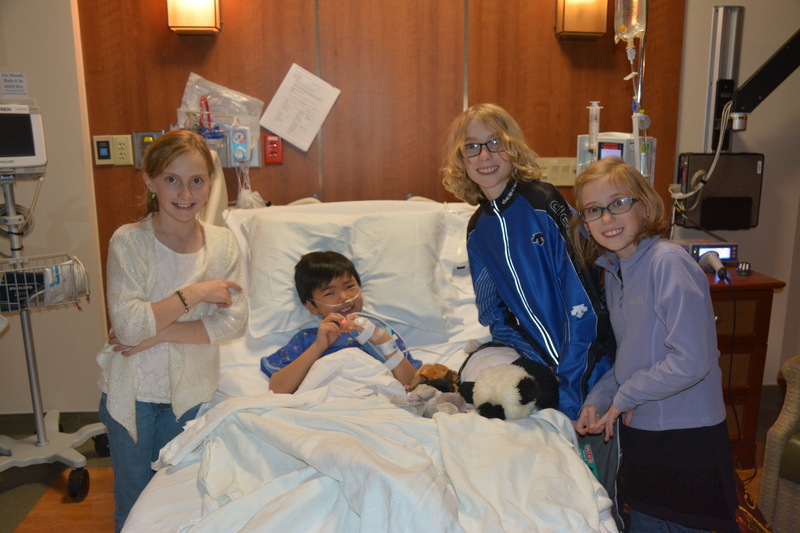 Just over one week ago, Mason said adios to his appendix. He hadn’t been feeling very good for a couple of days and because all of our kids were passing around the stomach flu, we were sure he had fallen victim to the same nasty bug. When everyone seemed to be getting back to normal and he was only declining, we decided to take him to the doctor. The only major pain (he he) was that it happened to be a Sunday night. Doesn’t that always happen? Anyway, Scott took him to the ER/Urgent Care at our local hospital and within an hour they were pretty sure he had appendicitis. He had all the symptoms plus an elevated white blood cell count so they sent him for a CT Scan and that confirmed it; he was headed for surgery. At some point between the scan and surgery, his appendix ruptured, making a huge mess and spreading infection into his little body. He spent about four days in the hospital, including Christmas, hooked up to IV antibiotics and oxygen. Mason finally made it home last Thursday to recuperate in his own bed. We were all relieved and have a new appreciation for our own pillows:) We have been so blessed by family and friends for the help with kids, calls, prayers and visits. We are grateful that Mason is at home, getting well and enjoying his Christmas presents. Of course, we would have loved to have a quiet Christmas at home but thankful that Mason is okay! Pictures to follow. I promise. Happy Holidays, Merry Christmas and Happy New Year to you all.